The cycle of disruption and renewal is good for customers, because it means they can get what they want faster, cheaper and easier. It’s good for progress and it keeps the world moving forwards. However many businesses fail in the cycle, which is a high price to pay. Being able to disrupt their own models is a necessary survival tactic that keeps brands ahead of the curve. To create the Best Global Brands rankings and report, Interbrand analyses across ten factors of ‘Brand Strength’. These include factors internal to the organisation, such as Clarity and Governance, as well as external, customer related, factors such as Authenticity and Engagement. When we analysed this database of information, we noticed something very significant about the top 20 growing brands from 2014 onwards. These brands scored significantly higher than others on two specific factors: Relevance and Responsiveness. What this means in practice is that the brands that are growing their own value the most do two things. They are highly customer-centric, creating and offering products and services that are extremely relevant to customer needs. And they are agile enough to evolve and adapt rapidly as customer needs continue to evolve and adapt. 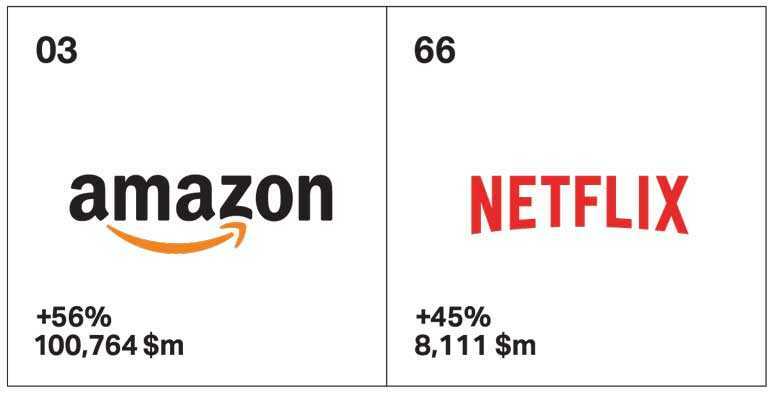 The fastest growing brand in our study this year is Amazon, which has increased its brand value by an impressive 56%, climbing to the third most valuable brand in the world and only the third brand to top $100bn. Amazon has achieved this remarkable success practicing the relevance and responsiveness we identified as vital to growing brands. It has kept a relentless focus on customer-centricity, and is willing to do whatever it takes to keep the customer happy, even if this means reinventing itself and disrupting its own business models. We can trace several revolutions and evolutions in the life of Amazon. Originally established as a bookseller taking on the traditional in-store model, it has grown into a one-stop shop for anything and everything customers may need. The journey has not always been linear either. Back in late 2014 for example, analysts were disappointed by third quarter results that were around $250m short of forecasts. Some interpreted this as Amazon starting to lose momentum and speculated that customers were put off by its acrimonious dispute with the publisher Hachette over e-books. With the benefit of hindsight, we can now see that Amazon was intentionally cannibalising some major product lines, offering free or nearly free music, video and e-books, in order to draw millions more customers into its ecosystem. Far from a sign of weakness, Amazon was intentionally disrupting not only other retailers but also itself, in pursuit of its long-term goal of ownership of the entire retail market. The purchase of Whole Foods, an addition to the Amazon Grocery offering, has seen it step into the traditional groceries sector. And now Amazon is set to make its most audacious move yet, with a new focus on the US healthcare system, alongside JP Morgan and Berkshire Hathaway. Transforming this dysfunctional system will be the brand’s biggest challenge yet, but the signs are positive that it can be done. All three companies have begun at home, by focusing on improving the quality and lowering the costs of healthcare for their own employees before bringing any solutions to market. Amazon as the saviour of the troubled US healthcare system would be a reinvention on a scale as yet unprecedented. Netflix, a new entrant to the table in 2018, is another prime example of a company that has turned its business model on its head, transforming itself in service of its mission. From the outset, Netflix aimed to crush Blockbuster by shipping DVDs by mail and abolishing late fees. But then it took the game to a whole new level when it began streaming movies and TV shows and, finally, investing vast sums in original content. Today, Netflix is one of the world’s most successful content-creators, spending a colossal $12bn on programming in 2018 alone and is in constant pursuit of innovation and improvement. Netflix has innovated by embracing options as they become available rather than shying away from them. The original postal model, for example, was improved by the addition of express delivery, prioritising customer centricity over operational costs. While video streaming wasn’t a new idea, it was Netflix that embraced it and the existing customer base, which already trusted the brand to innovate for their benefit, got them to the next level. In practical terms, it takes a great deal of courage to imitate Amazon or Netflix. From the CEO down, companies must be infused with a culture of experimentation, a willingness to take risks and a willingness to fail. It takes a relentless focus on the customer as well as the ability to simultaneously look through your business, your customers’ worlds, and the market in which you operate, through both a microscope and a telescope. Brands need to sweat over the details whilst simultaneously plotting a course towards a long-term vision.